A Twin Falls judge will hear arguments in court next week to determine if convicted murderer Sarah Johnson is entitled to a new trial. Fifth District Judge G. Richard Bevan has issued an order allowing Johnson to be transported from the Pocatello Women's Correctional Center to the Twin Falls County jail to attend the hearing, scheduled to start Tuesday, Dec. 7, and to conclude on Friday, Dec. 10. Though it remains a Blaine County case, the hearing is being held in Bevan's Twin Falls courtroom. Bevan was assigned the case with the retirement in 2009 of former presiding Judge Barry Wood. 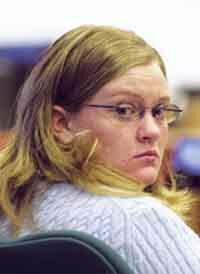 Johnson, who was 16 at the time of the murders and is now 23, has been imprisoned at the Pocatello facility since 2005, when Wood sentenced her to two life prison terms without the possibility of parole for the murders of her parents, Alan and Diane Johnson, at the couple's home in Bellevue in 2003. She was found guilty by a jury in 2005. Next week's hearing is part of a civil "post-conviction relief'" process that entitles a convicted person to seek acquittal or a new trial. Johnson filed a petition for post-conviction relief in 2006. The process was put on hold while Johnson's conviction appeal was heard by the Idaho Supreme Court. In 2008, the state's high court upheld the convictions and the U.S. Supreme Court later that year declined to consider the case. Hailey attorney Christopher Simms was appointed to represent Johnson in the post-conviction relief case when it was reactivated in 2008. Simms is alleging that Johnson did not receive a fair trial because she had "ineffective legal counsel." He further alleges that fingerprints identified on the murder weapon after the trial cast doubt on Johnson's guilt. Blaine County Prosecuting Attorney Jim Thomas said there is no basis for acquittal or a new trial. "We look forward to the opportunity next week to argue once again that Sarah Johnson received a fair trial," Thomas said. "We hope that a favorable outcome for the state will allow the remaining Johnson family members to obtain closure from this tragic event." Though Thomas originally prosecuted the Johnson case and has remained involved in proceedings since, the state of Idaho is actually being represented in the post-conviction relief proceedings by the Idaho Attorney General's Office. Thomas said he turned the case over to the Attorney General's Office because its appellate division is "very experienced in this aspect of the criminal process." The Attorney General's Office has argued in court documents that if Johnson's trial attorneys, Bob Pangburn and Mark Rader, committed errors during the trial, those errors were not significant enough to overturn the jury's guilty verdicts. The attorneys further argue that fingerprints found on the murder weapon were placed there by a Bellevue man who once helped sight the weapon. Simms has submitted a list to the court of the 22 people who may be called as witnesses during next week's hearing. Included are Pangburn and Rader, fingerprint experts from the Idaho State Police crime laboratory, and police officers who were involved in the original investigation, including Blaine County Sheriff Walt Femling and Ketchum Police Chief Steve Harkins, a former sheriff's detective. Also on the list is Johnson's former boyfriend, Bruno Santos. A court order states that Santos, currently a prisoner in the Blaine County jail, is to be transported to the hearing on Dec. 9. Santos, 26, has his own problems with the law. He's facing three felony drug charges in Blaine County for allegedly selling cocaine and methamphetamine earlier this year to an undercover police detective or a police confidential informant. The federal Immigration and Customs Enforcement agency alleges that he is in the United States illegally.